We've lost the name tag on this Aloe. It didn't have a name on it when we bought it, then we did some research and found the name, and then we lost it. Ouch. I'm sure we'll find it again, but in the meantime we'll just have to enjoy it...nameless. Unless, of course, one of you can ID it. The leaves are almost Gasteria like in their roughness and you can see the glorious flower. Help! Another example from our crested and monstrose plant collection. This is Turbinicarpus valdezianus, an old crest, beginning to show it's age. Another photo of some of the other plants in the collection. Echeveria 'Painted Beauty' has become a favorite of many...including myself. But, of course, I have many favorites. 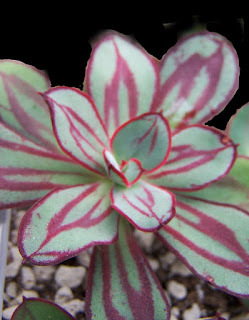 A natural variant of Echeveria nodulosa, the markings are about as flashy as you can get. 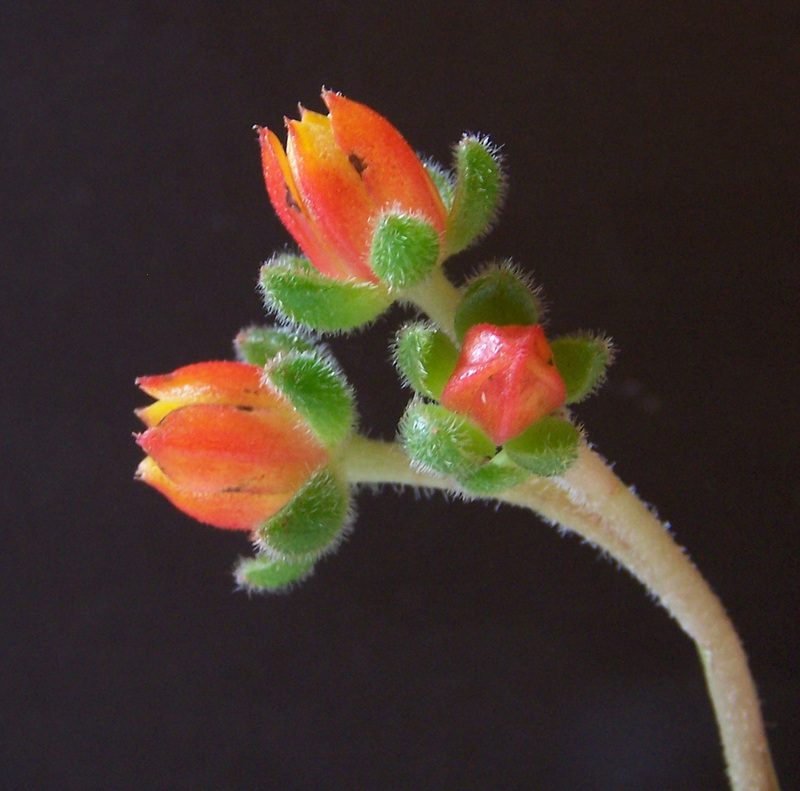 This is the flower of Echeveria setosa var. ciliata, at least the one we have listed in our catalog as such. It was originally purchased as Echeveria ciliata, but it's a little different than what most expect under that name, especially in the flower. And an outstanding flower it is. You have to get up close and personal to see the fascinating structure of these plants, Haworthia decipiens var. pringlei (seed grown from MBB6583 seed). I guess I'm going to have to find my closeup lens and get up closer and even more personal. OK. Who took my closeup lens??? From our collection of crests, this is a crest of Gymnocalycium uruguayense. You either like them or not, but I like 'em weird. To the eye of some, this - and most crests - qualifies. But I think they have a beautiful, sculptural quality to them. One of the classic Echeveria hybrids, Echeveria 'Doris Taylor' is a real beauty, a cross between Echeveria setosa and Echeveria pulvinata. An outstanding and easy to grow plant which should be in everyone's Echeveria collection. 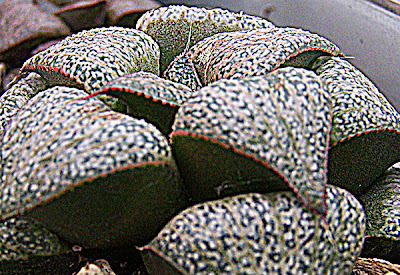 This is a highly stylized photo rendition of the Haworthia magnifica var. splendens (this time from the GM282 site, the type locality). By sharpening the image it brings out the patterns, the texture and the colors and helps us to see the amazing structure of this plant. We had a small turnout for the succulent society but a good meeting. Big plans are on the way. I never get tired of these plants. They're amazing for their texture and coloring. This one is GM452 of Haworthia magnifica var. splendens. I know Bayer has changed these names around but if you're into that you'll have no problem placing this plant. The lighting here (grey skies) doesn't do it justice, but the patina and colors are outstanding. I had a great time tonight at the Clackamas County Master Gardeners meeting where I was privileged to give a PowerPoint presentation on growing cacti & succulents. They're a great audience and a wonderful bunch of people; it was fun. I know the photo's a little out of focus but it shows some plants in our Alpine box, mostly sempervivums. But along the back are the Cyclamen coum, a very hardy little bulb from the mountains of Bulgaria, Turkey and Lebanon. During the summer they go dormant but can be made into a lovely little centerpiece by raising the bulb and placing it in a small bonsai pot. And at this time of year, they provide a real "pick me up" of winter flowers. Like I said yesterday, it's time for spring. The first floral harbingers for us are the Snowdrops (Galanthus nivalis) which are naturalized in several places around the yard. The first picture was taken today, the second last year. The light was hitting this Echeveria setosa just right yesterday. When this happens it reminds me again why we grow these plants. Fantastic. I spent the afternoon today clearing out the blackberry vines, holly seedlings and English Ivy that take over our "wild" area in front of the house. Tomorrow I'll be spreading some natural fertilizer, courtesy of Ladybug, on that area and on the garden area. It was very clear today that Spring is well on the way. 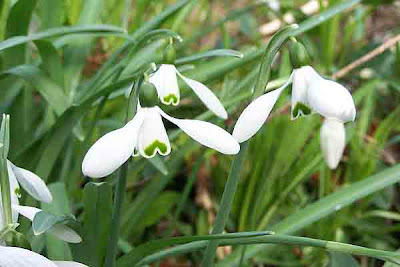 The snowdrops, of course, and some of the primroses are blooming. The daffodils are about ready to bloom, and the banana trees were barely nipped by frosts this winter. I'm ready. The weather was nice on Sunday and so we all took Ladybug out for a drive. Osita is the one tagging along after the cart. Our granddaughter was with us so she got to try her hand at driving as we headed out down Willamette Blvd in North Portland, near the University of Portland. I'm the one with the camera. Labels: Kara Nursery, Ladybug, Luther Sturtevant, Lynn-Marie Kara, miniature horse, University of Portland, Willamette Blvd. I think as we get older it's harder to keep up with all the name changes. We first received this as Gymnocactus ysabelae, but that didn't stick. 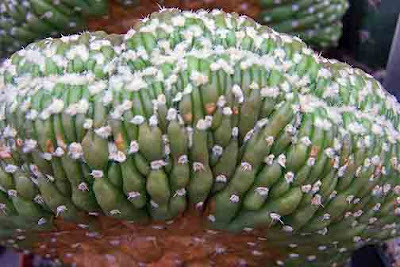 Then it became Turbinicactus ysabelae. But that didn't stick either. Now it appears to be Turbinicarpus saueri ssp. ysabelae. Plus, I have the bad habit of mispelling Turbinicarpus as well. Whatever its proper name, it's a beauty of a plant, apparently endangered in its native habitat (Tula in Tamaulipas, Mexico) from over collection. This is seed grown and is not at all common in collections. This sedum flower has been dominating one of our benches for a week or so. I'm not even sure which sedum it is, but right now it's a welcome early season flower. And as far as the outside plants are concerned, Spring is definitely in the air..and the ground. The Snowdrops are beginning to show their heads, daffodils are breaking up through the soil, and of course the iris blades have been poking their way up for several weeks. It's definitely coming! Today I just took a snap at one of the tables with Agaves on it...plus a few other miscellaneous things. We didn't start out with many Agaves, but we kept adding more and more...and more. We just couldn't resist. Many are quite hardy in our area...if it weren't for all the rain. With excellent drainage and protection from the rain, many will get through our winters fine.